Setting up a new nursery is one of the happiest moments for any would-be parents. They would like to arrange as many well-made pieces of furniture as possible. When the baby comes its crib and diaper changing table will become irreplaceable for all parents. They need to think about them way ahead of time so that they can arrange it properly. 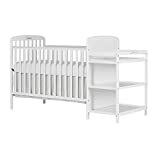 The crib needs to become comfortable for the baby and the changing table will need to have all the necessary things. So, it is always good to buy them way ahead of time. An item such as the Dream on Me, 4 in 1 Full-Size Crib and Changing Table Combo will definitely help the parents. So, let us know a bit more about it. This piece of furniture from Dream On Me has quite the list of features, largely due to how it combines an entire crib with a fully functional changing table. If you already own a crib, this model may be too big for no reason for your particular situation, hence why a simple, standalone changing table, like this Costzon changing table, may be more suitable for you. There’re even more options to choose from on our changing table buying guide. But back to the multifunctional Dream On Me crib-table combo, here are some of its main features. The bed is a 4-in-1 bed so it will be with the baby for a long time. After working as a crib one can convert it into a toddler bed, a day bed and into a full bed. It is totally safe for the infant. It meets the ASTM and CPSC standards. The crib and changing table are free from toxic things like phthalates, latex, lead, and BPA. The crib has the capacity to take the weight up to 35 lbs. The bed is quite spacious and it has been ergonomically designed to be light yet sturdy. The changing table has the exact finish as the crib to make it cohesive. They just weigh 50 pounds. The combo comes in 4 attractive finishes to go with all nurseries. The product requires assembly after delivery. The best thing about the product is that two things are coming in a combo. The crib will last for a long time as it can be convertible to different beds as the baby grows. They will definitely need to purchase the conversion components. The crib is lightweight yet sturdy. The changing table has ample amount of storage space in the bottom two shelves. The furniture set has been designed in a way that it is completely safe for the child. It reduces the hassle to buy a separate crib or a separate changing table. The available finishes look quite good and offer a neutral choice for all parents. The combo is quite affordable. The crib doesn’t come with a mattress. Neither the changing table comes with a changing pad. The person will have to spend time in assembling the pieces. But a handy manual is provided with the set. In conclusion, it can be said that the crib and changing table combo will be a nice addition to the nursery. The makers haven’t made any compromise while designing the set. They wanted to make something of good quality and they definitely have accomplished it. So, now it is on the parents to decide if they want to buy the combo or not. According to us, it is definitely a great choice for an affordable price.